At The C4AA, your contribution goes a long way. It’s tough times and artists and activists reach out to us regularly, wanting more training and resources so they can do their best work for social and environmental justice. People like Carrie in Houston, who is organizing a series of creative activism workshops to get artists and activists working together, Arian in Macedonia who is working on health access for trans people in one of the most repressive areas of the world, Nate in DC working on national-scale environmental actions, and dozens more. We provide them with consultation, resources, training materials and expertise. We also share that expertise with you through our webinars and podcast. But we don’t have a budget for this kind of work – we largely get funding for projects. To keep doing this rapid-response kind of work next year, your donations are what will make it happen! To show you our appreciation of your donation of $50 or more, we will send you a super special gift: a real limited-edition C4AA print. 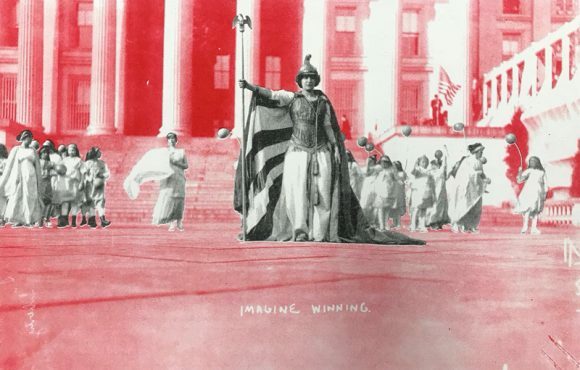 The IMAGINE WINNING print features an image from the 1913 Suffrage Pageant in Washington, D.C., with the actress Hedwig Reicher as Columbia. On March 3, 1913 more than 8000 women took to the streets with incredible costumes, nine bands, four brigades on horseback, 20 floats, and this performance near the Treasury Building. The marchers were demanding an amendment to the Constitution but were harassed and assaulted by mobs of thousands of men as police looked on. The suffragettes were undeterred, and struggle continued throughout the country. In 1920, the Nineteenth Amendment secured the vote for women. The print is made with a Risograph printer. Similar to silkscreening, riso printing enables a layering technique to produce multi-coloured prints. It’s printed on high-quality Speckletone paper, the first-ever recycled sheet with flecks and “shives” created in 1955 by the French Paper Co.
Creative Activism Webinars for free, every other Friday with special guests providing practical expertise from academics to practitioners like the Yes Men. More Art Action Academies around the world to train artists and activists to fight the good fight, like the one we just did in Queens, and our upcoming West Africa workshop. Publish and distribute our book, How to Win! More of our super popular Pop Culture Salvage Expedition podcasts. And a lot, lot more, including a NYC-based campaign around the opiod epidemic, a set of actions at the International AIDS conference in Amsterdam, an artistic activist toolkit, an app to help people like you make and refine creative campaigns, trainings for creative activists in the Middle East, etc. etc. etc! Can we really do all this in a year, or are we pulling your leg? We conducted 9 workshops for 110 artists and social and environmental justice activists and funders, in New York, NY, Brooklyn, NY, Queens, NY, Washington, DC, Dublin, Ireland, and Johannesburg, SA. We mentored 10 groups in South Africa, Macedonia, England, Ireland, Germany and Spain. Creative consultation through our Accelerator and Artistic Activism Grant programs have resulted in 10 new global creative projects across a variety of genres including performance and visual art. New in the past year, we created a free online training webinar series to give access to artists and others who cannot attend in-person trainings. Actipedia.org, our online database of creative actions, grew to over 2000 unique posts about innovative techniques and methodologies. We published articles and conducted ongoing research on efficacy of artistic activism, adding to our growing pool of over 50 interviews. C4AA founders Stephen Duncombe and Steve Lambert also gave 10 presentations and keynotes to a cumulative audience of over 2000, including at the United Nations, at the College Art Association Conference, at the Museum of Modern Art, the Folger Library in Washington DC and at the National Theatre in Oslo, and the closing keynote at the Eyeo Festival. We really appreciate your help in doing more of this work in the coming year.